Muslim convert and ex-military bomb expert Steven Arthur Younger sends the US government a tape showing him in three rooms, each with a nuclear bomb. The bombs are to go off in a few days and will kill six to ten million people. Helen Brody, an FBI agent, must find the bombs while H, a CIA "consultant" questions the suspect after the latter has been arrested. The terrorist does not crack even as H tortures him. H may have to do the unthinkable. 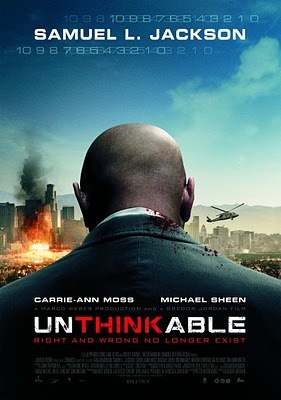 Unthinkable is one of those psychological thrillers that will make you think long after you've seen it. The plot is well-written and easy to follow. The acting is top-notch. The terrorist is a Muslim, which some may see as racist or bigoted. To me, however, having the villain as a Muslim man is not meant to stereotype Muslims but is a way for the film to get the viewers' suspension of disbelief instantly. Whether we like it or not, right now, many people associate Muslims with extremism. Unthinkable is a serious movie and it will be hard for people to quickly take the story seriously if the film will feature something different, like a Mexican or Filipino bomber (not impossible though, but that will probably need a lot of back story and explanation, slowing down the pace of the movie). Moreover, once you hear the terrorist's demands, you will actually sympathize with him. His demands are not selfish at all - they are not about money or pleas to release criminals. His wishes are very noble, in fact. Most of the times, people assume that extremists go on suicide missions because they want to go to heaven and be rewarded with virgins, but Unthinkable makes you stop for a while and rethink their intentions. The movie is graphic at times but the violent scenes are brief so even viewers like me who dislike gore won't have any problem viewing the film. The film's use of the violent scenes is actually good - they are not shown to glorify violence or just for shock value but will make the viewer uncomfortable enough to (re)evaluate his or her moral ground. There are viewers who claim that Unthinkable is a pro-torture propaganda. I disagree. For many people, including me, it is okay to kill or torture one person if that means saving others. Unthinkable challenges the viewers to really think about their stance in the issue by showing them what is happening, because torture as an abstract concept is very easy to justify, especially since the blood is not on your hands. But what if that terrorist was being tortured in front of you? What if innocent people would have to be harmed to make him talk? What if failure to get answers would mean the death of 10 million people? What if time was running out? What would you do and just how far would you go? ..haven't watched this movie.will watch this one. This is great! Eto ang movies na gusto ko, yung napapaisip ka sa huli! I will surely watch this. I am so excited to share this movie with my friends. Yay! I have this but I haven't watched it. Thanks for reminding me. I shall watch over the weekend. Thanks for the review! Haven't seen this yet :) Will definitely see it soon! This is my type of movie ,terrorist.I don't know but terrorists that I usually watched are Russians and Muslims but I don't stereotype them .we all know that it is just a movie .Russians and Middle eastern are just like any other nationalities ,there are good and bad .And Samuel Jackson is one actor that I really admires. yup. before, villains were usually Russians because of the Cold War threat. this movie is more of a drama rather than an action movie (no fight scenes, good guys chasing bad guys over the roofs, etc) but it is very engaging as well.